With its rich history and dedication to exceptional winemaking, Chalk Hill Estate has earned its place as one of the most iconic wineries in Sonoma County; perhaps none other captures the casual luxury of Sonoma County better. Founded nearly four decades ago, this spectacular 1300-acre property features 300 acres of vineyards, wilderness areas, winery, hospitality center, culinary garden -- and that’s just the beginning. Beyond its gorgeous estate, Chalk Hill’s never-ending quest for quality serves as the basis for all winemaking decisions, yielding some of the best wines from the region. Many varietals and vintages have been donned with acclaims from some of the most notable publications in the industry including Wine Spectator, Wine Enthusiast, and others. If you’re looking to explore some of Chalk Hill’s best, take a look at this list of lauded wines that span all tastes and preferences. 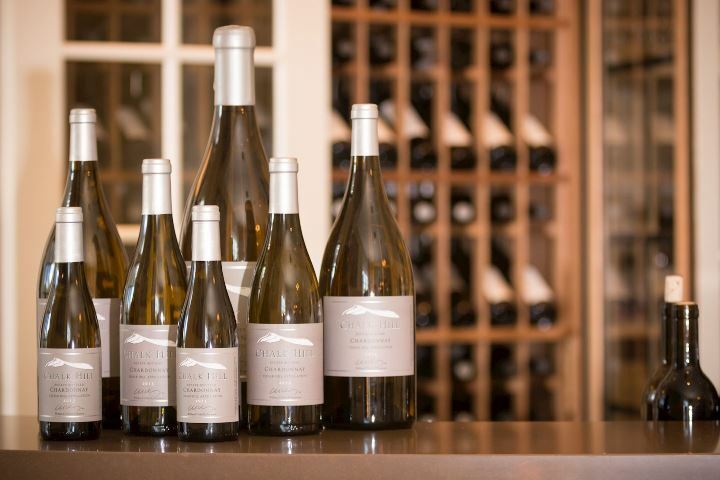 Call the Chalk Hill tasting room today at 707-657-4837 to order yours today or plan a visit! And if you can’t make it to Chalk Hill, use the links below to buy online or find a retailer near you! 91 Points, Wine Spectator | "Fresh and snappy, with ginger-laced green apple, citrus and honeydew notes shaded by light oak, gaining depth and nuance on the finish. Drink now through 2020." 94+ points, Robert Parker's Wine Advocate | "The 2015 Chardonnay Wright Creek is a cracking wine with a very classy nose of honeyed brioche, cashews and apple butter over a core of pineapples, lemon curd and pink grapefruit. Full-bodied, rich and boldly fruited, it has a gorgeous creamy texture and wonderful precision, finishing long and layered." 92+ points, Robert Parker's Wine Advocate | "Deep garnet-purple colored, the 2014 Syrah Estate reveals spicy black pepper, anise and cloves notes with a core of blackberries and black currants plus a waft of garrigue. The palate is a little oak dominated at this youthful stage, overshadowing the rich, ripe core of black fruits and spice box notes with rounded tannins and seamless acid to support, finishing just a little hot. With a couple more years in bottle, everything should fall into place in this promising beauty, although I’ve scored it conservatively for now." 94+ points, Wine Advocate | "The 2015 Estate Red is deep garnet-purple colored and delivers a good amount of oak-inspired notions to begin over a core of blackcurrant cordial, blackberry pie, preserved plums and chocolate box with hints of vanilla pod and cigar box. Big, concentrated and full-bodied, the palate is jam-packed with black fruit preserves, framed by ripe, firm, grainy tannins and just enough freshness, finishing on a woody note. Forget it for 5-6 years and drink it over the next 20."